While we are all spending time upgrading and preparing our camper vans for the next trip, there are some who have decided to abandon their motorised homes on wheels for a much more old fashioned or you might say 'traditional' way of living on the road. A while ago I posted about new age travellers in the 90's and shared a video of an old 'World in Action' documentary about their lifestyle, and the conflicts taking place between travellers, local residents, and the police in England at that time. Well, photographer Iain McKell has been putting together a project on a group of new age travellers, who have made the choice of 'returning' to the horse drawn gypsy caravan as their dwelling place. This smaller group are somehow managing to live in todays world in this old and simple way. Take a look at the photos – I'm sure you'll agree that Iain has captured some of the magic and beauty of that simple way of living. Having spent a decade putting together this collection of images, Iain has become close to some of the travellers, and has seen children grow up living on the road. 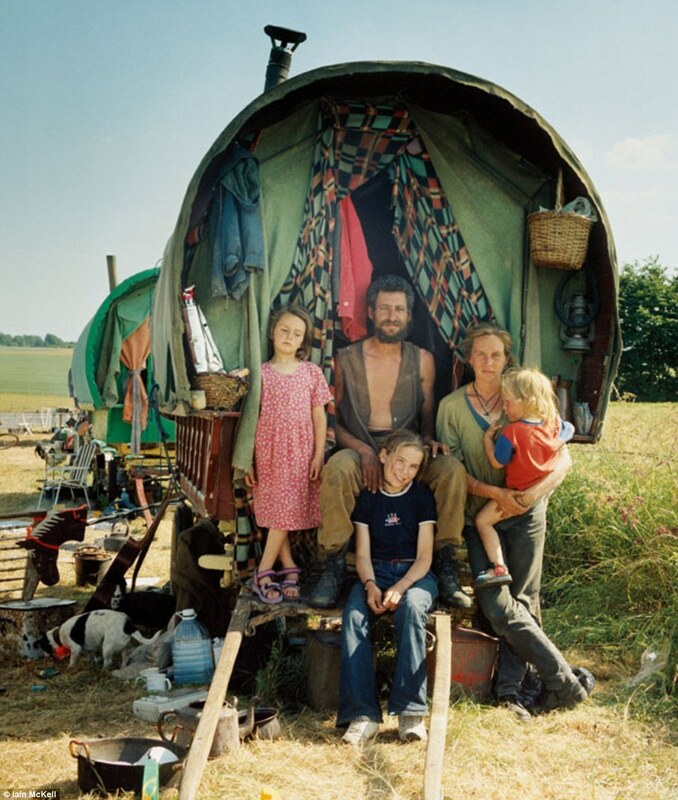 None of these modern gypsies are descended from the Roma - all belonged to the original 'new age travellers' movement that took to the road with the 'peace convoy' in the mid 80's, or have joined that culture along the way. When asked why he created these images Iain says, "To show a way of living that is both colourful and meaningful. Drawing from the past and combining with the future, creating a progressive new idea and values not based on materialism and not being chained by the stress and complications of our modern existence." Looking through these images, it strikes me that living in this way must have its challenges as well as its rewards. Covering any kind of distance is not going to be easy, and especially on todays roads its not going to be easy finding a route you can follow with a horse drawn wagon. I don't know the full story, but it being art I search for my own story behind the pictures. They must have places to move between were they are welcome, and that are not too far to travel - like the old days when travellers moved about where there was work and a way to sustain their lifestyle. I would certainly consider the possibility of converting a trailer into something in the style of a gypsy caravan, but I'd still have a tow bar that could be attached to a car or van - then I'd have the best of both worlds. There would be the possibility to go anywhere, and then to park up and live in a little wooden house on wheels with the romance and sense of connection to the past that you just can't find in a modern caravan. "We all desire nature deep inside and have a desire for freedom. A sense of there could be another way to live and to question what standards we apply to create a full life." If you're on Facebook, please 'like' the Hiace Hobo page there.